Incorporating even a small amount of Toile décor is a wonderful way to add visual interest and lend any space a unique look and a distinctive French vibe. Actually, Toile de Jouy meaning “cloth from Jouy” /often referred to as “Toile”/, is printing figural patterns onto cotton or linen. Ii is named after the town of Jouy-en-Josas in France and originated in 1760. At first, this fabric of superb quality was mainly with beautiful hand-printed botanical and fruit designs in red, black, or blue on a white or cream background. Although simple, with their fine lines, these first monochrome Toile patterns were truly pieces of art with a characteristic, unmistakable look. Later, patterns with pastoral and hunting scenes as well as scenes from farm life, travels abroad, and fascinating, intricate Chinoiserie patterns were also introduced. Generally, Toile patterns presented life in the 18th and 19th century. Similar patterns are produced in other French factories and in other countries, such as Ireland, but the name of the pattern is still ‘’Toile de Jouy’’. Whether replicas of the original two-toned patterns or modern designs in an array of colors and motifs, due to its unmatchable look, Toile décor is still a popular décor solution around the globe. As it works well with an array of design styles- from traditional French and English country to eclectic to even modern and fits into different décor solutions, Toile décor offers a beautiful, attention-grabbing way to add unexpected touches of color and pattern to any space. Furthermore, Toile de Jouy can be used in an array of ways to enliven and add visual interest and personality to any space. A popular choice for incorporating Toile is as wall covering. Actually, in medieval France, pieces of Toile fabric hung on chateau walls to beautify the space marked the beginning of using Toile de Jouy as a version of wall covering. Whether in the classic idyllic two-toned style or modern patterned in shimmering metallic, Toile wallpaper is a fascinating, creative option to both lend any space a luxury, romantic, classic look and add tons of charm and personality. As it creates a sense of intimacy and romance and a soft, feminine look, Toile décor/and Toile wallpaper in particular/ is a stunning choice for bedrooms. Above, a fantastic guest bedroom with a distinctive architectural character. Isn’t this all-red Toile space pure charm and romance? In the picture above, a classy traditional master bedroom. 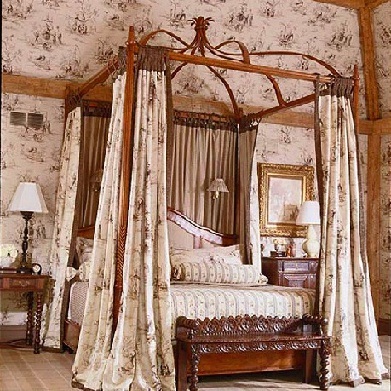 A mind-blowing four-poster bed, beautifully carved furniture pieces, and elegant accessories add to the appeal of the Toile-enveloped space. 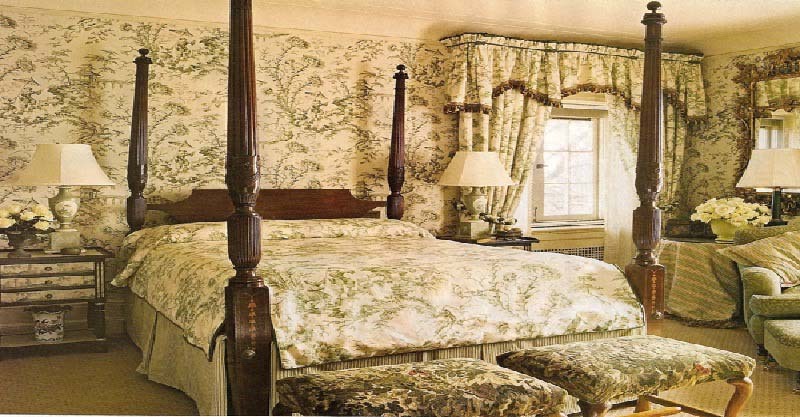 For harmony and balance, the Toile motif is repeated on the bed curtains. If not ready for such an extensive use of Toile wallpaper, you can apply it on a limited scale, such as for creating an accent wall. Above, a classic master bedroom. A Toile accent wall complemented by matching curtains and furniture upholstery adds visual interest to the space. An upholstered headboard creates a sense of luxury. A large wall clock brings in extra doses of visual interest and personality. Above, another example for a limited use of Toile. 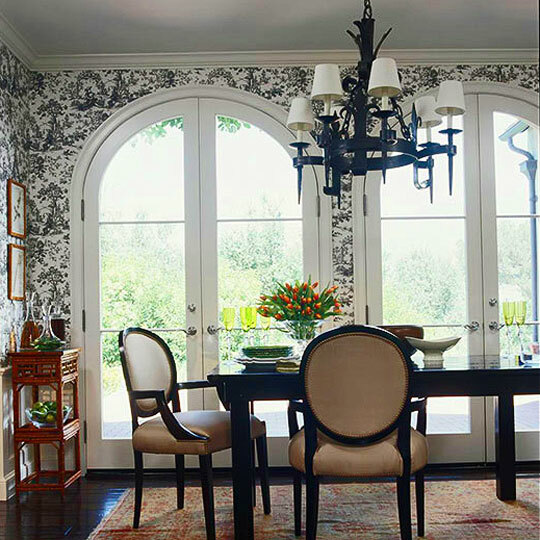 In this adorable traditional dining room, wallpaper in the classic Toile pattern in black and white covers the walls and add personality to the space. Large windows offer adequate natural light. Cut tulips on top of the dining table are a nice accent, which brings in freshness and extra charm. Note that Toile wallpaper also works well in nurseries, playrooms, and powder rooms. 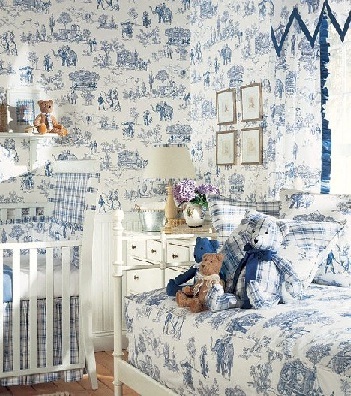 In the picture above, a lovely nursery decorated with carnival-themed Toile wallpaper and fabric in blue. Definitely a whimsical contemporary space! Combining Toile wall covering and fabric is another appealing option for incorporating Toile-style décor. Usually, Toile fabric is introduced by window treatment, upholstery, bed skirts, throw pillows, and bedding. However, because of its complex designs, Toile décor might look overwhelming and you need to carefully choose the color schemes. When decorating with red Toile wallpaper and want to add some Toile fabric, furniture upholstery is a smart choice. As for the curtains, for a visual break, opt for another kind of fabric that repeats the hues. When working with a monochromatic neutral-hued toile wallpaper, add an accent piece in the same pattern but in a brighter color. Anything from a headboard to throw pillows to a throw can do the job. Generally, as blue and green create a soothing, relaxing atmosphere, combos of wallpaper and fabric in these colors are a favorite solution for bedrooms. 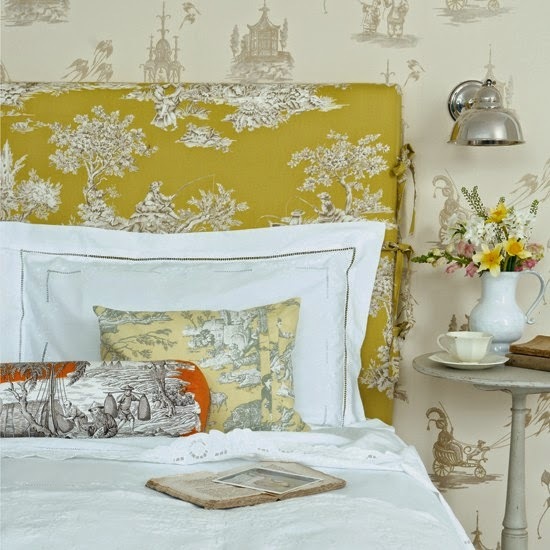 Combos of Chinese-style patterned Toile in a restful hue is also an adorable option for bedrooms. Note that not all Toiles are designed with equal pattern density and some designs have an unusually large amount of background. Such designs create a sense of space and can make bedrooms feeling open and airy. Above, a guest bedroom with a feminine vibe. Matching Toile in lavender and lime for the walls and canopy, lilac satiny pillows and bedside table skirts, molding in lilac…This space is pure charm and romance! A fascinating way to introduce the wallpaper-fabric combo is to use different classic patterns for the wallpaper and fabric. In addition, as modern designs are available in a variety of colors and work well with other fabrics, you can create livable, inviting spaces with a fresh, layered look. Above, an adorable bedroom with a feminine look. A combo of Toile wallpaper, a Toile headboard, and throw pillows in different patterns but in a complementing color scheme lends the space a unique look. A casual arrangement of flowers adds extra color as well as freshness and scent. What a way to create a charming, spring-inspired bedroom! Although Toile décor is versatile and can lend any space a casual yet refined look and tons of charm and personality, complex Toile designs can overwhelm small spaces and make them feel busy. If you like Toile décor but your spaces are relatively small or are not ready to fully embrace this décor solution, opt for subtle, make-a-statement Toile accents. A favorite way to integrate Toile accents is with window treatment and furniture upholstery. Both options will unquestionably create attention-grabbing, dramatic accents. You can use Toile to upholster dining chairs, bar stools, armchairs, sofas, and headboards. 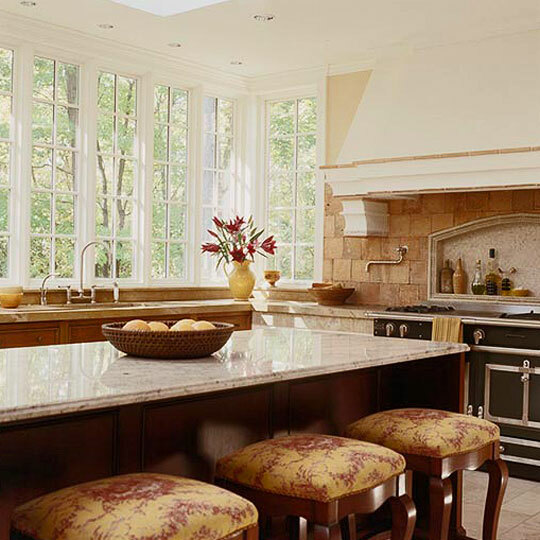 In the picture above, a stunning kitchen with Toile upholstered bar stools. What a way to add make-a-statement accents! As for Toile wallpaper, apart as wall covering, it works well on the inside of glass-front kitchen cabinets and armoires. Also, you can frame pieces of Toile and use them as wall art or cover screens used as room dividers. Actually, just think outside the box, there is an array of creative ways to incorporate Toile accents and add touches of unexpectedness to any space. In vintage bathrooms, a standard sink with a Toile skirt will definitely make a design statement. In kitchens, Toile tableware, tablecloths, cake servers, pitchers, tea sets, and dish towels will immediately bring in doses of French flair. With Toile patterns you can add personality to even mundane items as storage cans. 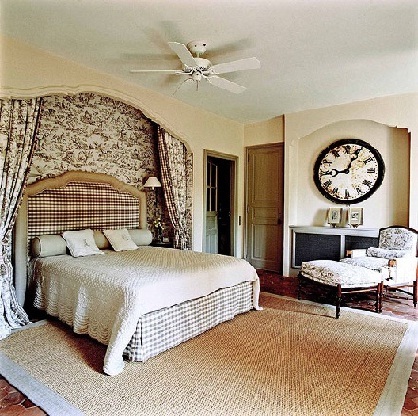 In bedrooms, pleated Toile used as a bed skirt will lend an elegant, tailored look to any bed. 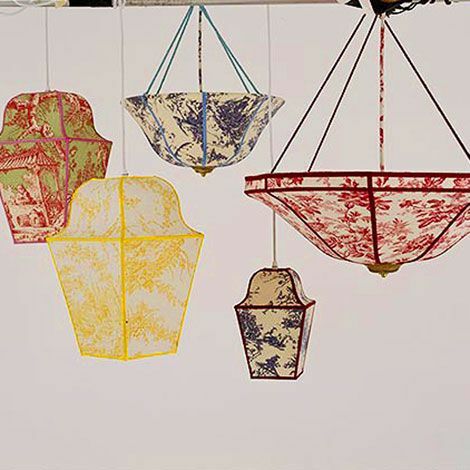 Above, Toile lanterns. 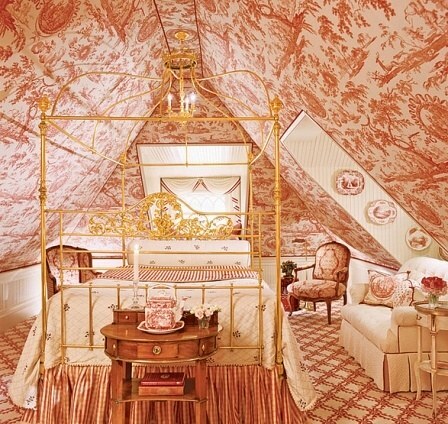 Definitely a creative, innovative way to incorporate Toile décor! As it adds extra color and pattern and touches of whimsy and definitely evokes a sense of nostalgia, Toile is a timeless décor option. Whether used extensively as wall covering, window treatment, and furniture upholstery or sparingly to make a statement, if you are willing to add some French flair to your living space, you can’t go wrong with Toile décor.